Wave of Mercy: Here We Go!!!!! Here we go! No one is more surprised or amazed that the ticker-thing on this blog says ZERO,-0- than me! I cannot believe how time flies. This past week I have been SO busy. Thank you to everyone that has had a hand in getting me on my way. Truly I would not be going without your help - which is why I say "here WE go" because I take all of you with me. I am heading to bed but wanted to just say goodbye for a short time. 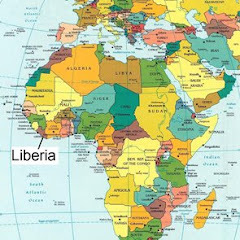 I will be traveling tomorrow afternoon thru Chicago, Brussels, and then on to LIBERIA!!! I will get to board the Africa Mercy sometime on Sunday evening. I will post on the blog as soon as I get settled and find my way. As I prepare to head out I ask just one more thing - that you continue to pray for me! Pray that travel is as smoothe as travel can be, pray that I find my way, pray that I stay healthy. I think I have probably said the word gratitude in almost every post. But, I cannot say it enough - I am filled with gratitude for EVERYONE that has supported me. Thank you for helping make my dream come true. Thank you for choosing to join me on this journey. I look forward to the adventure that awaits me. I am honored that God would allow me to be a part of His work. Thank you for joining me in this as well! Talk to you soon!